The St. Tammany Parish Sheriff's Office Narcotics Task Force is one of the best drug enforcement units in the country. It is comprised of deputies from the STPSO, Mandeville Police Department and Slidell Police Department. This unit is responsible for enforcing local, state and federal narcotics laws and investigating all illegal drug activity within St. Tammany Parish. Investigators in this unit are trained to conduct these investigations utilizing specialized techniques. In some cases, it is easy to identify suspects involved in illegal drug sales. In other situations, long, articulate investigations are required that may employ the use of confidential informants, undercover officers and the general cooperation of our community. 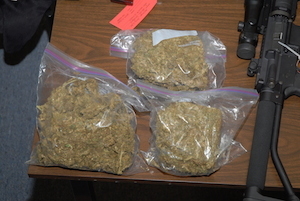 This specialized unit is in partnership with other law enforcement agencies such as the FBI, DEA and FDA. The 20 member task force unit is broken down into two units, with each unit being supervised by one lieutenant and two sergeants. The Narcotics Task Force Unit is responsible for the investigation of cases involving the use, possession, sale, manufacture and transportation of controlled substances. Other responsibilities include disposal of controlled substances, providing specialized training about controlled substances, directing all financial and asset seizure/forfeitures relative to narcotic activities. This particular unit also supports all local agencies in the parish. The Narcotics Task Force Unit is known for their 98% conviction rate within the St. Tammany Parish judicial system. Each agent is hand selected into this specialized unit. The St. Tammany Parish Sheriff's Office Narcotics Division has in place a completely anonymous method of reporting information about suspected narcotic activity. Citizens who want to help, but don't want their identity revealed, may call 1-888-GO-2-Jail (1-888-462-5245) with any information they wish to relay regarding narcotics activity in the parish. Information given through this tip line is recorded. This information is then accessed by narcotics agents on a daily basis and acted on accordingly. This technique has proven to be extremely effective and allows the citizen reporting the information to remain anonymous. Individuals wishing to speak personally with a narcotics agent can contact the division directly by calling (985) 276-1400.